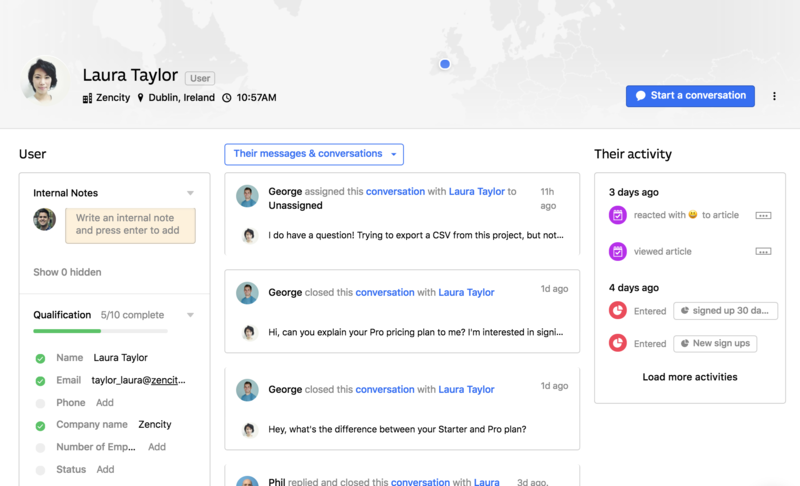 See the conversations you’ve had with companies and users, the plan they’re on, what they do in your app, where they’re located and more. At Intercom our mission is to make business personal. So we made it easy for you to get to know each user personally. All you need to do is check out their user profile pages to see things like what plan they’re on, where they live, what actions they have or haven’t taken in your product, and lots more. To get a personal picture of any individual user or company, simply click on their user name (or company name). You’ll see lots of useful information about your user in the ‘About’ column on the left-hand side of their profile. 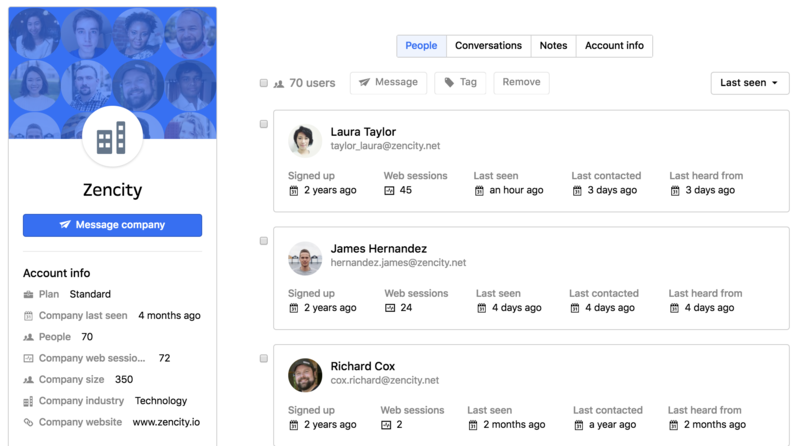 This is great for quickly checking information about a particular user like how recently they’ve been active, what language they speak or how many web sessions they've had. And, if you have sent Intercom any custom user attributes (for example, the plan your user is on) you’ll see that here too. When was your user last active? Have they taken a specific action in your product? When, and how many times? If you’re not sure whether a user has taken a specific action (we call these events) you can check the left-hand side of their profile. Assuming you’ve sent the correct event data to Intercom, you can see when a user has bought an item, for example. And by clicking on the event, you can view any metadata you’ve recorded about that event like the name and date of the purchase, for example. Are your users part of a specific group? 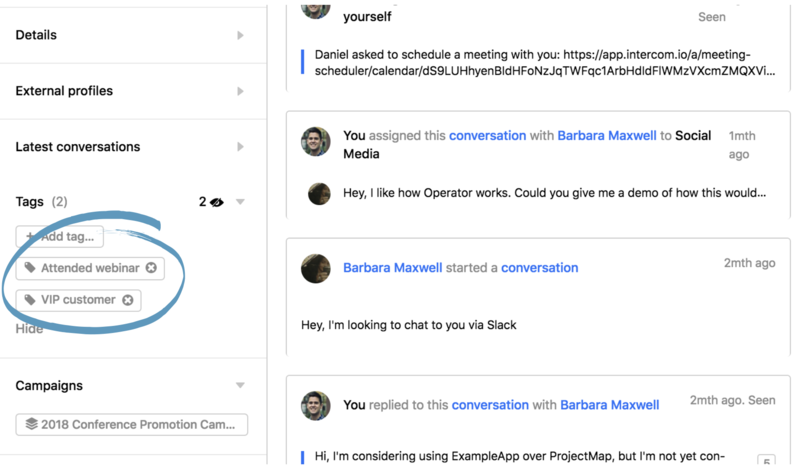 Intercom lets you group your users together into useful groups by tagging users or creating custom segments. You can view any tags you (or any of your teammates) have added about your user in the left hand side of their profile. For example, you can quickly see if your user is tagged as a ‘testimonial candidate’, a ‘beta customer’ or a ‘VIP customer’. You can also check if your user has been added to any custom segments you have created. For example, your user might belong to your ‘trial user’, ‘hot prospect' or ‘pro-plan’ segment, as long as they match the criteria you set for that segment. What’s your relationship with a user? 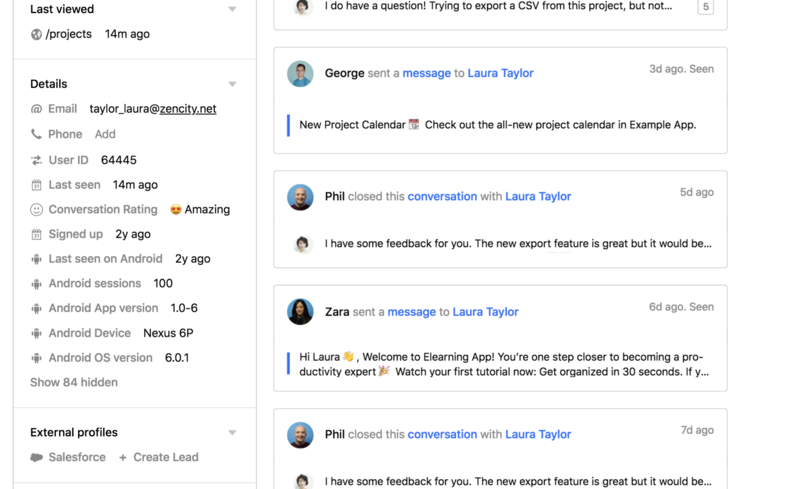 If your team members have left any useful notes about your user you can see it in the left-hand side of that profile. This is great for leaving additional context about a person for the rest of your team who might look at this page later. You might want to add an internal note when a customer is considering upgrading their plan, for example. 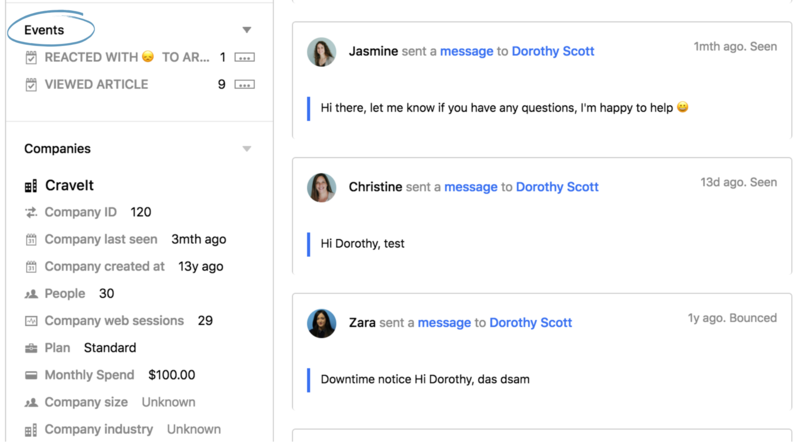 Or you might want to let your team know that a particular user is a good friend of your company, if they’re a good candidate for a round of beta testing, or if you had a call with them where they were particularly unhappy about something. Company profiles give you an overview of the state of your relationship with each company at a glance. For example, you can see if the company is new, active or slipping away, how long they’ve been a customer, how many session counts they have, when they last logged in and much more. What plan are they on and how are they using your product? You can click on the ‘Account Info’ tab on any company profile to view information about your company’s account and how they’re using your product. 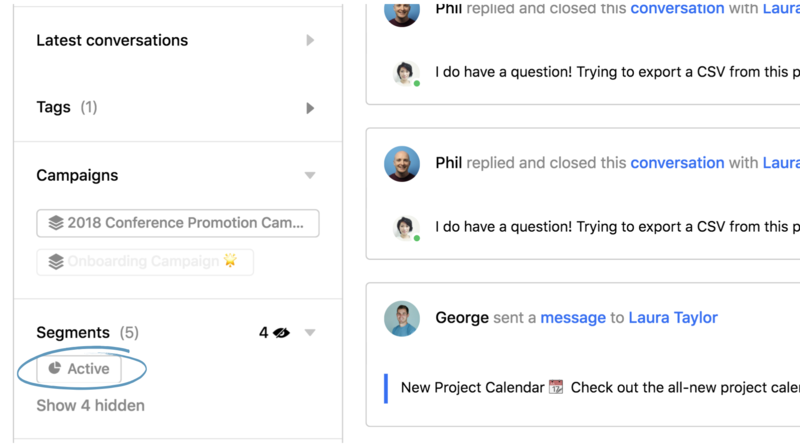 You’ll be able to see things like what plan they’re on, their monthly spend, how many people in the company are using your product, when they were ‘Last Seen’ and more. 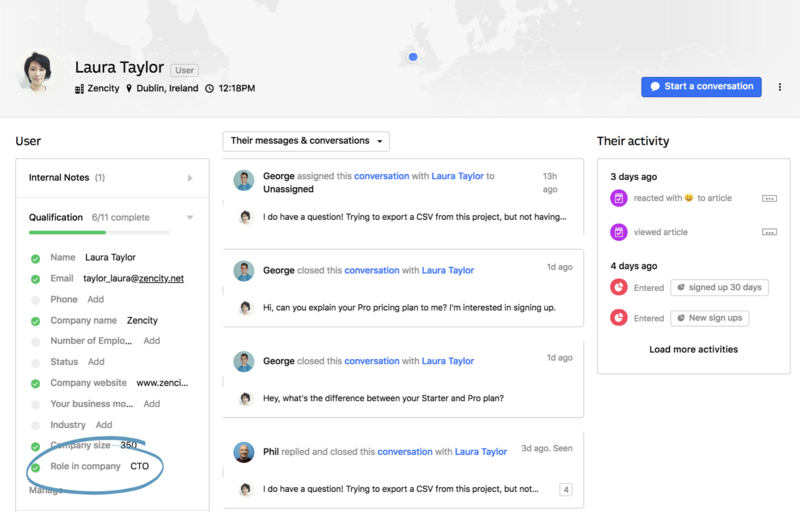 If you have sent any custom company attributes to Intercom you’ll see this data here too. What role does a user hold in a company? When you view any company profile you will see a list of the users that work at that company. You can click into that user’s profile and tag them as an ‘Admin’, ‘Marketer’, ‘Developer’, ‘CEO’ or whatever title they hold. Then, if you want to check whether you’re talking to the Marketer or CEO of the company you can simply check the the tags in your user’s profile. What's your relationship with a company? When something important happens with a company you want to be able to record an internal note about that company so that all your of colleagues are aware of it. For example, if a company has raised a new round of funding you can let your colleagues know by leaving an internal note. 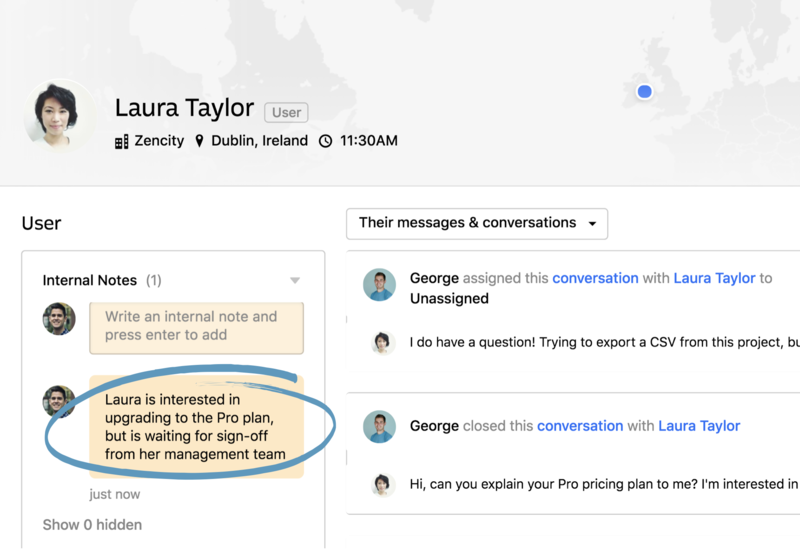 Click on the ‘Notes’ tab to view any notes your colleagues have written about that company.